Safety System Dysfunctional Before Mine Blast NPR NEWS INVESTIGATION: Legally required water systems at Massey Energy's Upper Big Branch coal mine in West Virginia were not functioning properly before the April 5 explosion that killed 29 mine workers. Some experts say these systems might have helped prevent the disaster if they had been working properly. Legally required water systems at Massey Energy's Upper Big Branch coal mine in West Virginia were not functioning properly before the April 5 explosion that killed 29 mineworkers, according to multiple sources familiar with the disaster investigation. Some mine safety experts believe that these safety systems might have helped prevent the explosion if they had been working as designed. Nine months after the Upper Big Branch coal mine explosion, investigators are homing in on possible causes. This interactive map presents some basic information about the area where the explosion is believed to have originated, along with possible causes. The illustrations are not to scale. Each of these dysfunctional systems funnel water to the longwall mining machine that investigators believe was the source of the deadly explosion. When they're functioning, the systems spray water on the longwall's cutting tool, known as a shearer, and along the coal seam as the shearer cuts into it. The sprayers help keep coal dust down so it won't clog the lungs of miners or float in the air. When coal dust is floating, it is highly explosive. The sprayers also help cool and extinguish sparks when the shearer cuts into hard rock.﻿﻿ The shearer also contains a water-based fire suppression system. 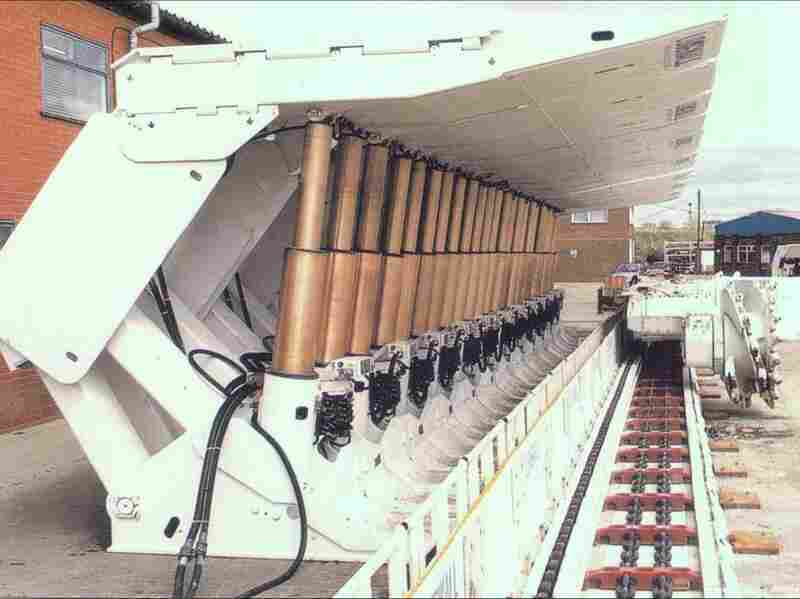 This longwall shearer and face equipment is not the make or model used in the Upper Big Branch mine, but it illustrates the size and function of the machines. This image is used by R. Larry Grayson, a professor at Penn State University, in a course about underground mining. But on April 5, none of these safety systems were working properly, according to four people familiar with explosion evidence. -- The fire suppression system on the shearer. Sources say it didn't work. Massey Energy admits that one of two valves on the system was missing, and a hose was "manually plugged." -- A water-spraying arm or boom at the shearer was disconnected, according to sources. Massey says it was broken off. -- Sprayers on the shearer itself were missing or clogged. Some looked like they had had nails driven into them. Tests conducted on the shearer sprayer system before Christmas indicate little or no water sprayed the shearer as it cut into six inches of sandstone in the coal seam, and likely kicked off sparks and churned up coal dust. With no effective water spray, any seepage of explosive methane gas could easily ignite and form what miners describe as small fireballs. Add floating coal dust and those fireballs are apt to trigger massive explosions. Heard On 'Weekend Edition Saturday"
"What typically happens with these ignitions is that water sprays on the miners can put these ignitions out," says Ellen Smith, owner and editor of Mine Safety and Health News. "All the backup systems worked when something went wrong. Smith has collected and reviewed federal reports of methane ignitions in underground coal mines. "We know that there have been about 600 ignitions since 2000," Smith reports. "And they have not resulted in mines blowing up." Smith points out that a mine's ventilation system also works to control coal dust and methane underground. The system manages airflow so that methane gas dissipates or is swept away. Good ventilation also helps control coal dust. Inadequate ventilation has been a persistent problem at Upper Big Branch. "The water and everything, that would have helped," says Stanley "Goose" Stewart, a veteran coal miner at Upper Big Branch who once operated the longwall shearer. "But ventilation is the biggest factor in my mind." A week before the blast, miner Gary Quarles told Stewart that the ventilation at the shearer was so weak and the coal dust so thick, he could barely see. Quarles died in the April 5 explosion. Stewart survived a smaller blast underground in 1997. "When I saw the glow coming in from behind the wall down on the [tailgate], I took off as hard as I could toward the [headgate]," Stewart recalls. "I thought I was a dead man. I was engulfed in fear." Two miners likely experienced something similar on April 5 at Upper Big Branch, according to NPR's sources and Massey Energy. The two men were working at the longwall shearer when methane gas seeped toward it. There's disagreement about the source of the methane. Massey has insisted that a nearby crack in the mine floor produced a sudden, unpredictable infusion of gas that could not be controlled. It's located just beyond the longwall at the tailgate of the machine. Part of the fire suppression system is accessible and has been examined, but the entire system is not accessible for examination. In the examination that we have been able to conduct, we determined that the valve located at the head of the shearer is missing and that a hose was manually plugged. Because we have not accessed the entire system, however, we have been unable to test the system or determine whether the system could be activated from the valve on the tail of the shearer. Our investigation into this issue is ongoing. We have found no records regarding the missing valve or the plugged hose and no witnesses aware of such issues. The purpose of the water sprays is to allay dust. The sprays are not designed to prevent or extinguish sparks or fires. In fact, shearers routinely spark while cutting with all sprays operating. This shearer had 44 sprays more than what was required in the plan approved by MSHA. After the explosion, we determined that eight sprays were missing. We cannot tell by our examination if these sprays were missing as a result of the explosion or whether they were missing before the explosion. We have found no written records indicating any problems. We have no reason to believe at this stage that they were deliberately removed. We also know of no motive for removing them. Under normal operating procedure, the crew would have checked the sprays during the shift and our belief is that this experienced crew would have replaced any missing sprays or addressed any issues with dust. Our tests indicate that the spray system would have operated similar to normal operating conditions even with missing sprays. Some sprays were clogged, but we believe this was likely due to rust that we feel was a result of the fact the sprays were idle for months before being tested. We have no reason to believe at this stage that the sprayers were not working properly at the time of the explosion; however, in any event, the sprayers were not designed to prevent sparks or ignitions, as discussed above. This is untrue to our knowledge. The orifices on some sprays were found to be slightly bigger than normal and we heard some investigators speculate that nails were driven into the orifices to open them up. We have not heard anyone suggest that nails were used to defeat the spraying function. Nails were not found in the orifices and the wider openings in the orifices would not defeat the system — it would just allow the sprays to put out more water. We know of no motive for defeating the sprays. Some of NPR's sources point to two additional cracks back toward the headgate of the longwall but close to the shearer. One is a newly discovered crack found between two of the floor-to-ceiling shields that protect the machine and the miners from falling rock as they work. These sources describe a scenario in which methane from that crack migrated to the tailgate, bypassed the shearer and its methane detectors, then turned back into the spinning and sparking shearer. Other sources say it's impossible to determine the precise source of methane. They note that Upper Big Branch is such a gassy mine that methane seeps from the coal face and the mined-out area known as the gob. Even if methane suddenly rushed out of a crack, that's a predictable event, says Smith of Mine Safety and Health News. "These huge inundations from gas seams have occurred in this mine and in other mines," Smith notes, referring to federal records that also track these incidents. "And when the ventilation systems were working, you did not have an explosion." On April 5, the two miners at the longwall shearer most likely witnessed the formation of a small fireball, sources say, as methane reached the shearer and its sparks. If the ventilation was poor, they would have known that floating coal dust would soon explode. So they ran. Investigators know they ran because they either shut down the longwall machine themselves or phoned the machine's operator at the tailgate. In any case, power and water were cut, and 60 seconds later, the mine erupted. The two men were found about a third of the way up the longwall face along with two other miners. They were gone in an instant, as were 25 others as much as two miles away underground. The new revelations show that the mine had "conditions that created a circumstance that allowed an explosion to happen, which never should have happened," says Mark Moreland, an attorney whose law firm is officially designated as a miners' representative in the disaster investigation. Moreland's firm also represents the families of two Upper Big Branch victims in wrongful-death suits filed against Massey Energy. "This operation was not operated according to law and was, in fact, if all these circumstances are true, operating in an illegal fashion," Moreland contends. On Friday, the Moreland and Moreland law firm amended its existing wrongful death suits to include these new revelations and to add members of the Massey board of directors. "The information [reported by NPR] is consistent with our findings," says Rachel Moreland, whose role as a miner's representative gives her access to the disaster investigation. Moreland and Moreland also has its own mine safety expert assessing evidence. "We have no information to the contrary," Moreland adds. It's not clear whether properly functioning water systems would have controlled or quenched a fireball April 5. Massey Energy notes in a statement that "the sprays are not designed to prevent or extinguish sparks or fires. In fact, shearers routinely spark while cutting with all sprays operating." But Amy Louviere, spokeswoman at the Mine Safety and Health Administration, says that "properly functioning sprays are designed to reduce the likelihood of frictional ignitions." It's also not clear why these water systems would be disabled. Some of NPR's sources speculate that the motor on the shearer was running hot, so water from the sprayers was diverted and used to cool it down. But others say that doesn't make sense because the water that goes to the sprayers is used to cool the motor first. NPR: Would properly working sprayers have prevented an initial ignition of methane/natural gas by sparks from the shearer? MSHA: Properly functioning sprays are designed to reduce the likelihood of frictional ignitions. NPR: Would a fire suppression device on the shearer have contained or extinguished a fireball? MSHA: Fire suppression systems are designed to extinguish potential fires in or on the body of the equipment protected. A fire suppression system is not intended to extinguish a fireball. 1. Nails were driven into the sprayers on the longwall shearer in an apparent attempt to defeat the spraying function. 2. The spray bar at the longwall shearer was unplugged so that it was not spraying water on the face. 3. Some sprays were missing and appear to have been deliberately removed. MSHA: If these issues were encountered by the investigation team, they would be thoroughly examined. Furthermore, as you know, MSHA policy has always been to provide updates to family members before sharing with the public or press. Those issues discussed at the family meeting next Tuesday can be shared with interested reporters the following day. Stewart says sprayers sometimes malfunction and end up spraying the miners instead of the coal. That might explain missing sprayers or jamming nails into the devices. "We cannot tell by our examination if these sprays were missing as a result of the explosion or whether they were missing before the explosion," the Massey statement says. "We have found no written records indicating any problems." Massey also says it appears some orifices for the sprayers seem to have been widened abnormally, but the company says it has no evidence nails were jammed in them. "We know of no motive for defeating the sprays," the statement says. Whatever the reason or the result, Robert Ferriter, a senior mine safety specialist at the Colorado School of Mines, finds the NPR revelations disturbing. "It seems like it was all production, production, production," Ferriter says. "And whatever you have to do to keep the shearer running to get the production, do it." Massey Energy continues to insist it puts safety first in its mines. The Mine Safety and Health Administration declined to comment in detail pending a private briefing next Tuesday in West Virginia for families of the victims of the tragedy. The families haven't had a briefing about the investigation in three months. As to the other issues raised by NPR, Louviere says, "If these issues were encountered by the investigation team, they would be thoroughly examined." A federal criminal probe is also under way. The Department of Labor announced Friday that it is postponing promised public hearings into the disaster at the request of U.S. Attorney Booth Goodwin. In a statement, Goodwin said, "Holding of public hearings at which testimony would be taken could hinder the criminal investigation and any potential prosecution."